David Branch knew a life on the streets wasn't going to be a good thing, so he worked to become a mixed martial artist. Saturday, he fights in the main event at UFC Fight Night 116. 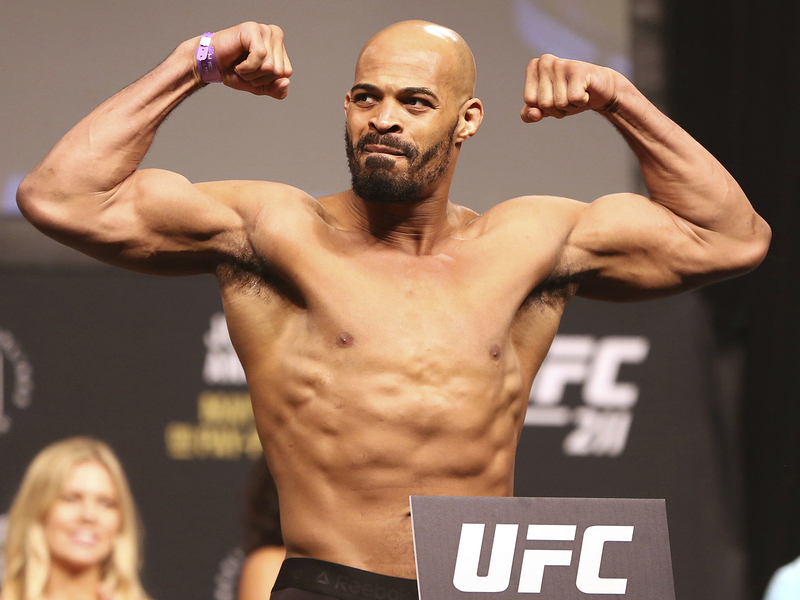 On Saturday night in Pittsburgh, David Branch will step into the cage in the main event of UFC Fight Night 116 against former middleweight champion Luke Rockhold. It will be the highest profile fight of Branch’s career, which includes a stint as a two-weight champion in World Series of Fighting. And while the spotlight that comes with his first main event in the UFC brings pressure, Branch has already won by overcoming insurmountable odds. Branch grew up in the Bronx in the ‘80s, witnessing a reality most children aren’t exposed to. Living in the projects, Branch’s mother never sheltered Branch or his siblings and Branch found himself fighting outside every day, when the older guys in the neighborhood would try to toughen up the younger kids. At 10, Branch moved from a rough neighborhood to perhaps an even rougher one, in Harlem at 135th Street, just down the block from Broadway, the drug port of New York. “All of the purest cocaine you could get, that’s where it was,” Branch said. The move wasn’t an escape, or a fresh start, but instead a new target. As a new kid in the neighborhood he was constantly being tested. “The only way to establish yourself was to fight,” Branch said. Home wasn’t solace or a safe haven for Branch either, who bore a striking resemblance to his father. That likeness made him the target of his mother’s ire, as she grappled with his absence. At 13, Branch was on his own, staying out on the streets to avoid being home, where he had to sneak around to stay out of the line of fire, even to get food. Branch was taken to a hospital for evaluation and landed at St. John’s Group Home For Boys in Far Rockaway Queens, a safe distance from the destructive home life and dangerous streets, perhaps a chance to salvage some bit of his youth. Branch was placed in 2C Diagnostics with an array of kids, most of whom were neglect cases whose families didn’t care about them. Branch suffered multiple injuries, including multiple broken ribs. Branch and the other kids would tie hangers to the door and stick them into the keyhole from the inside to prevent staff members from entering the room late at night. If the kids didn’t, there was a chance the men put in a position to protect them would beat them. The guards preyed on this aggression among the kids, with “green lighting,” the term used for the fight tournaments the staff would make the boys participate in. Using couches to make a squared off ring, it was unit against unit. The doors would be locked behind the kids to prevent anyone from not participating. That lasted for 18 months, when Branch was given a clear bill of health and told it was time to go back home. But he felt depressed. In 1995, Branch found himself back in West Harlem struggling to survive. He would steal food from supermarkets with his brother to eat. As a young man, Branch began to realize the value of money. Rap videos showed men with nice things, getting nice girls and inspired Branch. Branch began to work with drug dealers in the area, and at 14 was holding half a kilo of heroin at a time. He would carry that package 30 blocks on a bike to deliver it, with dealers following him in a car to make sure nothing went wrong. Eventually he graduated to selling, pocketing $30 for every bundle sold. “You can sell freakin’ 50 bundles of dope in an hour because the drug use was so heavy,” Branch recalled. In 1996 at 15 years old, Branch was arrested for the first time by an undercover police officer. Branch was placed in the back of a van and while riding around in the van, Branch spotted his mother and alerted the police officers. “I’ll never forget man, when they opened the back of the van doors and my mom seen me sitting in the back of that thing,” Branch said. “My mom had no idea what I was doing at the time when I came back from the group home, but when they opened the van doors and my mom seen sitting in the back of that f---ing van, I’ve never seen a look of pain inside of my mom’s eyes, or disappointment. It didn’t deter Branch, who returned to the streets. Four months later, Branch picked up an additional charge and had to appear before the same judge who immediately remanded him on the spot. After being incarcerated, Branch was involved in two fights and six months in, incited a riot. He was moved a second time, this time to Tryon School for Boys, the same juvenile facility that housed and taught Mike Tyson to box at 12 before he went on to become the heavyweight champion of the world. A new facility didn’t mean new ways. Branch got into a fight after his first week and heard the words that set him on the straight and narrow for the time being. “They told me, ‘We’ll kill you up here. We don’t want you up here, we don’t like your f---ing kind of people and if you f---ing act up there is no one up here to help you. You won’t make it back home,’” Branch recounted hearing the white guards say. When Branch returned home, he was struggling to find a new and legal way to survive. Branch found himself bouncing in and out of Rikers Island and spent the last 19 months of a sentence at Greene Correctional Facility. When Branch was released, he was committed to abandoning the life of the criminal. Odd jobs in construction kept him busy and paid, and he enjoyed demolition. The “Brotherhood of Construction,” a group of inner city guys with criminal records worse than Branch’s, recruited Branch into their coalition. The group would intimidate contractors into giving their members work. One day, Branch was returning from an odd job and as he got off the bus at 176th in the Bronx to catch a train home and his life changed forever. A homeless, drunk guy was selling VHS tapes on the street and one caught Branch’s eye. It was UFC 3. Branch bought the tape for $5, went home, watched it immediately, and found his calling. Between different job sites in Brooklyn, Branch found a traditional jiu jitsu school. He stayed for three years, and started taking karate and competing. Branch decided to pursue MMA and went to Relson Gracie’s satellite school in the Bronx to work with Michael Casey. Branch was a natural, winning every competition, but he was still fighting demons and bad habits, like drinking. In 2003, Branch decided to stop smoking for a week in preparation for his first competition, “Battle at the Beach.” After a decisive win, Branch vowed never to smoke again. In mid-2005, Branch joined Renzo Gracie’s gym and Renzo asked Branch if he wanted to take a pro-MMA fight, his first one, in 2007. “I was scared to fight because you had to get medically clear, which means you had to get your blood work done,” Branch said. The results of that test terrified Branch, who retraced all the missteps and poor choices of his youth on the street as a drug dealer in his mind. All the women who wanted drugs but didn’t have money. “It was the longest two weeks of my life,” Branch said. Branch was given the all-clear and a weight lifted off his shoulders. “From that moment right there, from that one test, I was like I got to change,” Branch said. At Cage Fights 6 in late September of 2007, Branch had his first professional MMA fight against Craig Simone. It took him less than two minutes to end the fight and get the win. In his seventh fight in 2010, Branch finally got his shot in the UFC, and lost to Gerald Harris via a knockout on the slam in the third round. In March 2011, Branch lost for the second time in the UFC, his fourth fight in the promotion and was subsequently released. It was six years before Branch returned to the UFC. He found a home in World Series of Fighting, winning 10 consecutive fights and the middleweight and light heavyweight championships, defending both belts simultaneously. In Pittsburgh, Rockhold will stand across the cage from Branch. A former middleweight champion with aspirations of regaining his title in his next fight if he can defeat Branch. It’s the most visible and highest-profile fight of Branch’s life, but it’s hardly the biggest.